Today Mercury, the planet of connections and communication, moves into its sign of ruler ship, Gemini, where it remains until the end of this month. We may think we already know all there is to know about connections and communication – after all we’re post-modern aficionados with our iPods and iPhones and of course… there’s the internet. But for the next fifteen days, the message of Mercury isn’t just about texting your friends where to meet up for drinks. Instead it’s about how to make connections in a completely different realm – that of the Gods. 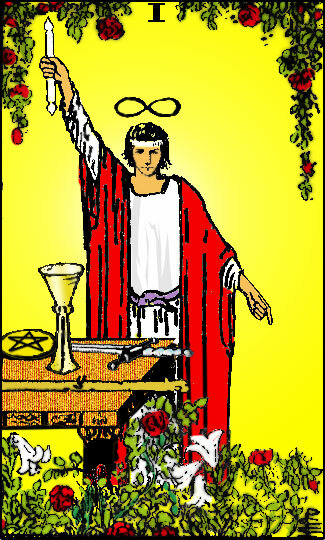 Mercury is represented by the second of major arcana tarot, The Magician, also known as the Creator and Trickster. In this aspect, Mercury relates the creative principle behind duality – black and white – right and wrong. Mercury’s truth lies beyond appearances – Mercury’s truth is that all elements and energies are one. Air is fire, is earth, is rabbits, is pigeons, is water, is ONE! All are whole and all are holy. The implications of this are massive. Once we come to grips with Mercury’s message, we no longer spend our days filled with the fear of tomorrow and the regrets of yesterday. Instead, once we’ve integrated the message of Mercury, we are free to live in the creative moment of the ever present now. Know that it’s only in the now that we can touch the timeless world of the Gods. Such is the power of the human intellect and imagination – which for the next two weeks will be enormously fertile. During this period we are instinctively attuned to what some may call miracles – those astounding instances where the inner workings of our psyches collide with actual events in the material world. For the next two weeks, Mercury asks you to pay special attention to events that seem to happen out of the blue – perhaps an unexpected letter from a childhood friend or a job offer arrives from thin air. Be rest assured there’s more to these coincidences than meets the eye – never, ever take them at their face value. Mercury requires you to do whatever is needed to puzzle through them; this could take some time. But be rest assured that something of great value rests within them; make whatever effort is required to find it. With Mercury in Gemini, the hidden truth behind the “momentary smoke” of our Zen master erupts into consciousness – giving you a treasured glimpse into of the world of the Gods. Previous article Saturn in Libra – Watch the Fur Fly!